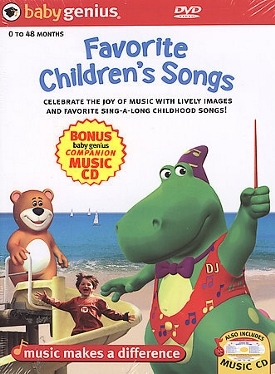 The Baby Genius gang (Vinko the Dancing Bear, Frankie the Elephant, Tempo the Tiger, DJ the Dinosaur, and Oboe the Monkey) presents a variety of children's songs, both old favorites and some originals. The songs, combined with colorful visuals, include The Muffin Man, The Wheels on the Bus, Take Me Out to the Ball Game, and Pop Goes the Weasel. Very nicely animated with children interaction. My son really enjoys the songs.